In 1993, a booklet by H. van Haeringen was published by Coulomb Press Leyden, Leiden, the Netherlands. 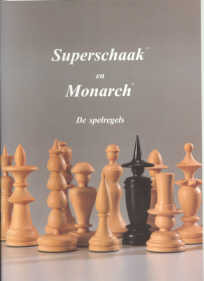 The book, called Superschaak en Monarch was a Dutch book, giving the rules of two chess variants. It has 32 pages, ISBN 90-71421-25-2. Later, a translation of the book in English appeared, and a larger book, in Dutch. In the book, the rules of Superschaak (Superchess) are given. Players have freedom for several details of the game. A large collection of 50 different pieces is described, and the players should agree which of these are used. There is also a choice of board: 10 by 10, 10 by 8, 8 by 10, or 8 by 8. But there are also fixed rules, e.g., where pawn-like pieces should be at the start of the game. The rules are clearly described. Most striking is the cover of the book, with really beautiful wooden fantasy chess pieces. Monarch is a variant of the game, with differences at some details.